It's hard to see on the screen. When you buy it and receive it, it will be hard to see in your hands. The image is by Nicholas Hughes, it's something I found at Chris Higgs's blog. Some people helped me with the design (Stephanie Barber and Leah Ammerman). 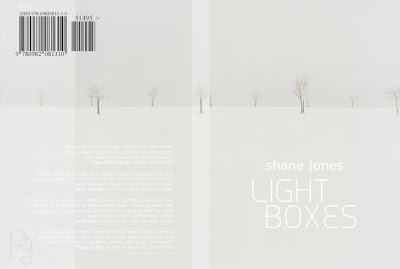 This book cover is really light on light. Let me know if you want to review this book. All attempts to manufacture sulfuric acid have failed. After discarding the useless chemistry set I received for my birthday, I have rummaged many times through our kitchen cabinet, and I have made many combinations, but have not achieved anything close to science. I tried mixing milk with orange juice, but these proved not to be the acid and base I thought they were. Later, I mixed all the spices and juices and ketchup together, and then added a dash of Tabasco sauce, but this did not produce so much as a puff of smoke. Not even a bubble. Afterwards, I tried to clean up the mess, but our cat, April, would not go near the stuff. That's a great joke and it gets better from there. 2. Today I remade the Publishing Genius website a little. It's simple and I don't know CSS but I like it. 3. Something about a massive reading at AWP. You said it. Thanks Ryan. The cover looks awesome. The new site design looks awesome. Awesome all around! The cover looks great, much better than any other cover you might have considered. Chris, thanks for pointing out the image on your blog. I saw it, said whoa, said that's it. Michael, you got the straight dope. I'll review it for Newpages if you send it over there. Unless someone else snaps it up. My "Pets" review will be out in days. Sweet, thanks Sean. I'll send a copy there once I get one. Maybe tonight I'll send you the advance PDF. I'm looking forward to your "Pets" review. I'm liking reviews lately. I wonder what your tone islike in a review. Yeah, you win with the cover design. Well worth all the trouble. Thank you justin, for the compliment and the help, natch.